I was out walking with the camera this morning, thinking that I am so privileged to be surrounded with process. And the time to consider it. 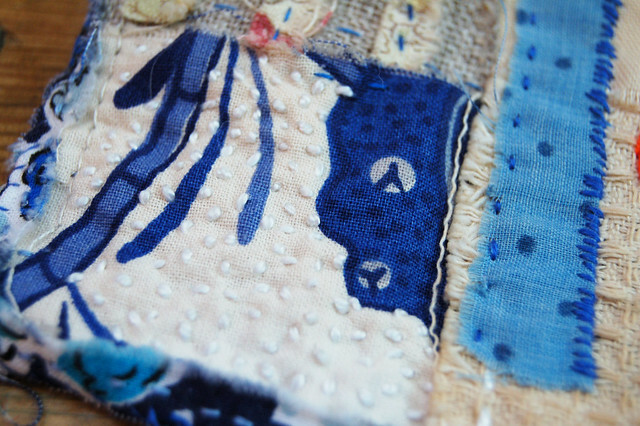 The finished art quilt has a slight vintage look, even though the embroidery style is more contemporary. In my mind the blue hues works well together with that vintage feel. When I think vintage blue is the colour that comes to mind. 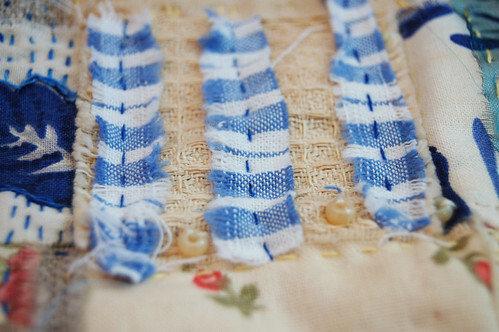 I like washed out blues, and patterned kitchen fabrics like towels and checked table cloths. I think its interesting how similar this quilt is to a previous art quilt I made (the grandma quilt). They resemble each other in feel and colour even though the starting point was very different. I am fascinated with making new surfaces to start on these days. 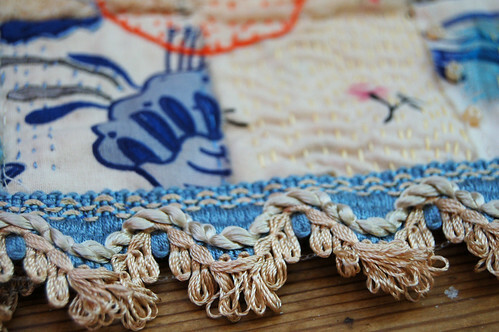 To weave a cloth base for embroidery is similar to making a painted base for collage. When you paint with acrylics or dye a fabric you “make it your own” in a way that I am embracing more and more. Tweaking the process trying to mix different techniques. You start by creating a unique surface to start adding your own ideas to. When you start with an “altered beginning” you have a base that nobody else has. No one else will have the same starting point. 1. Slow Cloth has the possibility of joy in the process. If efficiency and sameness are the primary goals, it’s not Slow Cloth. 2. Slow Cloth can be contemplative. Not every moment of making is a serene mystical precious experience. But the totality of your work opens space for you. Like the old saw, you may not be able to define it but you know it when you see it or feel it. 3. Slow Cloth honors skill and has the possibility of mastery. Rather than choosing easy or instant-gratification methods, you’re aiming for an ever-expanding level of fluency and grace in the techniques you work with. Read the rest of the “slow cloth” list at handeyemagazine. 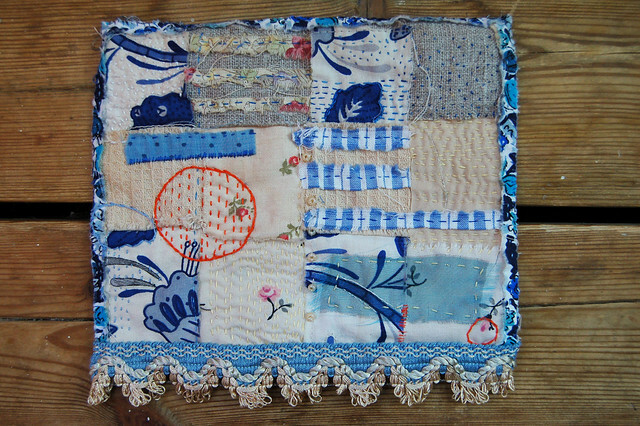 This entry was posted in Fabric Art and tagged art quilt, blue, embroidery, grid, handsewing, slow craft, vintage, weaving. Bookmark the permalink. I found your site from Pumpkin Delight. I love it. I?m going to poke around a little bit, but don?t worry I?ll put everything back where I found it!! Hanna, as always, you bring me such inspiration! This piece is so peaceful. So beautiful. Hanna, it’s beautiful. Mouth dropping beautiful. Your work always inspires. It is a thing of age and beauty put together by hand. Hanna these are both stunning! I love the Grandma quilt, it seems to me very, very vintage. This blue one reminds me of the 40’s and 50’s and kitchen towels and curtains… Wonderful! Makes me want to learn to sew!!! More please!!! I really enjoy looking at your embroidered pieces. You have such feeling for putting the fabric, stitches and colours together. Yes I agree with the previous. More please!! I like you slow cloth a lot! 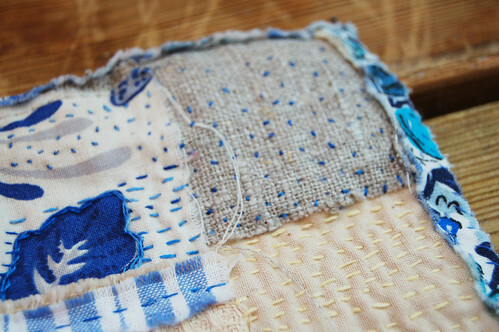 Isn’t it wonderful to work with something as meditative as stitching!? This is totally amazing, Hanna. You have such skill with fabrics and stitches. The complexity of the layers of texture, the subtle colors – just a gorgeous piece. First – I love how your “Slow Cloth” project turned out. Although a bit more structured, only because I have an end result in mind, I am currently in the middle of a project in which I am also weaving my base and then embroidering on the surface – if it ever, ever gets off the loom that is! Are you familiar with Saori weaving, Hanna? If you like I will send a couple links – let me know. I think it would be a perfect fit for you.